'That was great," frowns the gentleman in the Abbey Theatre lobby, his shirt untucked and hair and beard ruffled as if caught in a moment of post-coital bliss. "It was interesting seeing which parts this Dublin audience found funny and which ones they didn't. It can be dramatically different from place to place." This is Antrim playwright David Ireland on the opening night of his play Ulster American. As black, inflammable, slippery, and indeed corruptible as crude oil, it has garnered five-star reviews and frothing headlines. "Brilliantly brutal satire" sang one write-up of its sold-out run to the 2018 Carol Tambor Best of Edinburgh Award. At the same time, Ireland's work is stalked by mentions of "trigger warnings", gratuitous shocks, walkouts, and thoughts that he is out to poke the PC bear, even if he is able to double-over in laughter a beat later. The customary whiff of danger is here, alright. A fey English director, a preening Hollywood Oscar-winner and a gifted Ulster playwright meet up in a London sitting-room to discuss a new sectarian-themed work due to begin rehearsals the following morning. Before the writer's arrival, the two men go down a rabbit hole, their chat taking on a twisted edge as professions of liberalism warp into uglier shapes. Joined by the young woman, the conversation must suddenly accommodate her Ulster Unionist background (a tricky enough task in the Brexit prism, the play reminds us) and other identity landmines. And because it's David Ireland, there will be blood. Like many wonders in the arts, the play was rejected by everyone his agent sent it to, too hot a potato for the big London theatres. Eventually it was picked up by Traverse, a company who embrace the typically unorthodox Edinburgh spirit year-round. "I never thought they'd do it because I wanted a big-name famous actor in it," the 43-year-old admits a day earlier when we meet in Belfast's Lyric Theatre. "I had Leonardo DiCaprio in mind, the biggest name imaginable. A couple of weeks after they signed up to produce it, I was waking up in a panic, going 'this will be career suicide for all of us!' I was ringing them up, saying 'are you sure you want to produce this play?' They loved it, but at that stage I was getting very worried." In reality, Traverse knew what they had on their hands, identifying, as director Gareth Nicholls puts it, issues that are "absolutely at the forefront of people's minds across the world" - "power, consent, male privilege". None of this remotely occurred to Ireland at the time of writing. Cyprus Avenue, his similarly black 2016 confection that brought Ireland to wider renown thanks to a Stephen Rea-led Abbey production, was about to debut. Ireland, with cheery abandon, decided that Cyprus Avenue was going to be a huge failure and that Ulster American would be the last thing he'd ever write before cutting his losses and going back to the simpler life of being a jobbing actor. "I was quite philosophical," he chuckles, "thinking, at least you can say you put a play on in the Abbey with Stephen Rea and who cares if it's a disaster. Now you can just move on with your life. So I decided I'd just put everything into it that I had been thinking about theatre, culture, identity. I think that's why it's so overloaded with themes. I just unloaded everything off my chest. "There's been a lot of discussion about what this play is actually about. For me, it's always been about what you can and can't say. What is unsayable now and in what context, and what can I say as a playwright. What the character of the actor says is pretty offensive and shocking, but the point of the play is that he says it, and if someone says something like that in a private situation and they have power, how do you respond? What's the right thing to do? "Certain critics responded by saying that that section of the play is unjustified, and they may be right, but it's not done flippantly. And because the audience members tend to laugh, it makes people uncomfortable. It was a surprise to me when they did." Laughter and a brand of humour that feels particular to the writer's native province is something central to Ulster American and Ireland's other work. On the opening night, as characters thump fireballs back over the net at one another, you hear sharp intakes of breath and uncomfortable yelps. They are brought to heel as Ireland's stunning pacing makes space for self-examination and hints of pathos, only to hit a switch with a painfully hilarious one-liner or outburst. Helpless, hopeless belly-laughs explode at this point, en route to bludgeons of bemusing mayhem. 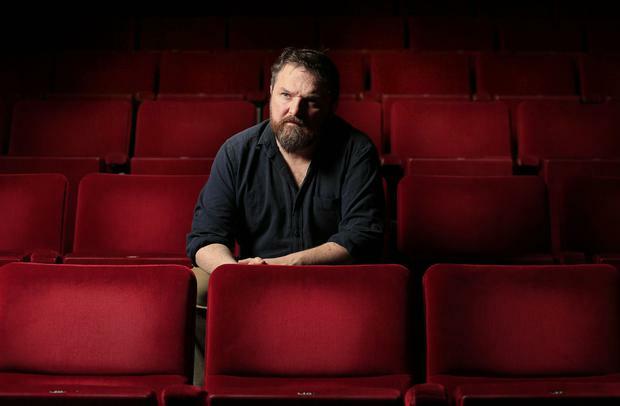 A Nordie Martin McDonagh, if you must, or the Ben Wheatley of stage drama. Based in Glasgow (where he has lived for years with his wife and their two young children), Ireland tries to get back as much as he can and keeps a close eye on matters above the Border. Meeting him this morning, a stone's throw from Belfast's beautiful Botanic Gardens and university campus, he seems to embody a new configuration of his community, a proud unionist who voted Remain ("Having grown up around people fighting about being part of the UK or not, it feels weird to now see people fighting about this other union. I had an instinct it would be destabilising so why risk it. I find it bizarre that the DUP didn't realise that") and who can see being a product of "a civil war" for what it is. "My niece said she wanted to talk to me about the Troubles because she was doing it in school. I find that fascinating because we were never taught about the Troubles and I think that's because it was 'during the Troubles'. They were probably worried that if they taught us, we'd go out and kill someone. I never knew anything about Irish history until I was about 18 and I taught it all to myself. I had this profound, obsessive hatred of the IRA, and I remember thinking I really needed to learn about them, to find out about why they believe what they believe. So I went and bought Tim Pat Coogan's The IRA and after about 50 pages I was like, 'okay, I can see their point of view'. Maybe it's not as black and white as I thought it was." Ireland soundtracks such candid recollections with uproarious, self-effacing laughter, but there is something tragic to the admissions, something that makes you wonder just how different things could have been with more of his open-mindedness and curiosity in those days. No wonder he has such fun with the character of the hammy US actor who cannot compute being from the island of Ireland but being British, something that didn't stop for the playwright after his drama school days in Glasgow and journeyman years in London. People, Ireland discovered, want you to fit their simplistic idea of you. "Irish-Americans have such strange perceptions of what 'Protestant' is," he laughs. "When Cyprus Avenue was on in New York, I met this guy, a very funny guy - I won't mention his name but he's a very powerful person - and he mentioned something about me being Catholic. This was after having seen the play, and I said that actually I wasn't Catholic. He said, 'oh yeah, I saw the play and I heard that whole I'm British thing, I don't buy it, as far as I'm concerned you're an Irish Catholic." A more genial fellow you will not meet, a return, he says, to the cheery demeanour of his Carrickfergus childhood following the "generalised anger" of his teens and early twenties that he saw across his generation as sectarianism, frustration and puberty melded to horrifying effect. Perhaps the plays have helped exorcise some demons, he wonders aloud, and with more for him to yet explore with those themes, his ambition to pen a rom-com will have to wait. "I'd love to," he gushes. "But I don't know if I have it in me yet. I just finished a new play and it's pretty dark and funny. But I was reading it back the other day and thinking it's not violent enough. It needs a big violent scene!"